Words from the 18th Special Great Works workshop. 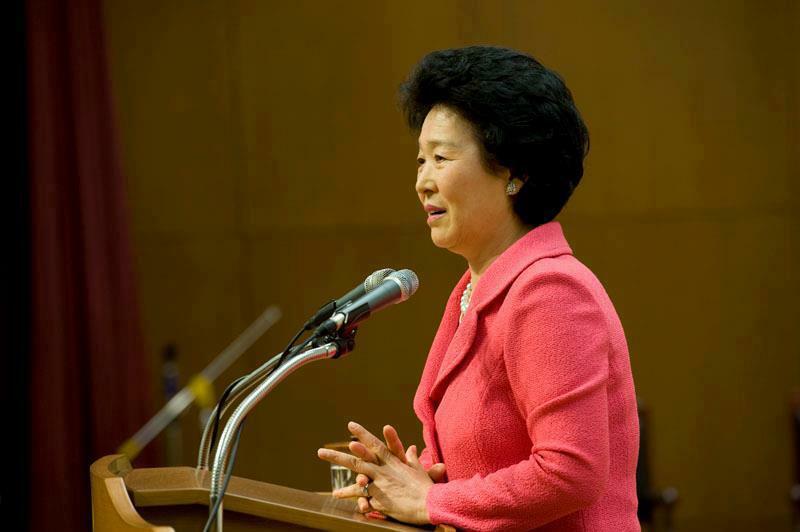 Included are some comments from Chairman Ha, and also excerpts from True Mother's talk at the national worship service at the Cheongshim Peace World Center. "Thank you very much. It is already the 18th anniversary of CheongPyeong works. It seems like CP works began yesterday. It is like a dream now. Then, even without sending out any official memo, we began. I felt that I just had to believe. So, we began. God said: if we arrive at CP, members already come. It was cold at the time, just like this. There was no word that I would be coming. When I came to CP, there were only 3 Japanese members waiting. They had a very difficult spiritual situation. I cleared the problems up. Then, the 3-day workshops began. There were many who worked in the church. Since CP opened, members have come continuously. More and more came for workshops. As I began CP works God told me that many people would come. I wondered, can so many really come? We thought that as Blessed families, we have no OrigSin and that we can go to heaven. As blessed families, we have much merit from our ancestors and we have TPs, and that we can do "anything." We thought and lived as if we were completing everything. It was very hard for me to express to them that they would not go to heaven, and that they had many ES. I worried a lot. TrueFather had told me: you have to do the ancestor liberation ceremony. I wondered how I could convey such an idea to members. But you believed me. We already had Lee Bong Min (spelling? ), who dealt with EvilSpirit. TF said that the time now is different. At that time, we could only liberate the ancestors. But they could not become AbsoluteGoodSpirit. It was not yet the time for that. But now, at CP, we can make ES into AGS. This is due to TPs victorious realm of authority. TPs said they have to become AGS. Now the ancestor liberation ceremony is different. TPs explained it that way. You understood very well. If we had lived a life centering on AbsoluteFaithLoveObedience, then we would not have done this ancestor liberation ceremony, and we would not have had CP. If we had lived lives of AFLO, all our sins would automatically have cleared up. If we had gone in the direction of goodness, our ancestors could also have become perfected. But, because we lived a life centering on fallen nature, our ancestors could not walk the path of perfection, and we could not go to perfection. Plus, ES worked on us so strongly. But now, our ancestors are settled down. I have to go to SW to look for the ancestors one by one. We already have ES settled in us, and causing pain, suffering, and disease. It is spiritual pain, suffering, disease. Since we have CP, we have to clear all of this up. We have to take out the ES that are inside us. We could have just called our ancestors before, and they could come to us. But now, we have to go and get them. And then they must be educated, so that they can become AGS. If we separate ES, they do 100 days education, and then return to us as AGS. If you liberate more and more ES and more AGS can come to you, you can have heavenly fortune. We cannot go to heaven, because our fortune is very small. The spirit self is surrounded by ES. If separated ES go to the spirit world, then it would be okay. But, when ES come out of your body they drag you here and there. At a Seunghwa ceremony I could not see the spirit of the person because it had to go somewhere else. As we seunghwa, the number of AGS grows. ES are more than AGS even after 18 years of CP. We have to know clearly. Many things in our life are caused by spiritual reasons, hereditary sin. We reflect our ancestors. Our speaking, acting, gestures, clothing style, etc., all are in accordance with our ancestors. When our finger is cut slightly, when we fall down, these incidents are caused by a spiritual reason. This is hereditary content. Without clearing, this hereditary disease will be given to our descendants. We have to live life based on AFLO, not centering on ES. This message I have been giving for 18 years, but it seems you still don't understand. Members who I counsel, they still don't understand. SGW workshop is so important. We have 34 days to FD. What kind of new era will it be? The CIG era. TF told me: we have to do until 210 generations. Why? Before FD. Why? Now, I understand. When we meet FD, we thought that the blessing brings perfection. We think: FD is the opening up of a new heaven, etc. We think, even without WitnessingActivity, we will live well. This is not right! Those who live with fallen nature, jealousy, anger, complaint, etc., those kinds of people have lived well in the world so far, because evil has dominated. But, from today 460 BILLION AGS are helping us. Since we have that amount of AGS, goodness is developing, and we will enter a culture of FD. TF: this is the era without indemnity. But this is from the perspective of God's entire providence. From FD on, our world will be made separately with AGS. In this new era, then, we have to live well. Thus, it is a scary era. If we do our best, living with AFLO, then heavenly fortune will be in us. But, if we live un-Principled, and live poorly, indemnity will come to us. Now, indemnity is invisible. If we take a small glass to help some family, it is one thing, but if we act wrongly internally, many indemnity conditions will follow us after FD. The FD era is a good era, but at the same time it is a very difficult era. Centering on Principled words we have to educate myself first. Is this Principle or not? Then we have to educate our relatives. We have lived lives of un-Principle. Life with habits that are un-Principled, is very difficult. But, with life based on Principle, it is much easier. We have to let our un-Principled life go. Is that easy? No, because human history has been so long. But, we have Principled words, the best words, and TPs life and words now, rather than ES words. This is the era of AGS. We will be able to live centering on good works. 210 generations will help us and protect us. With the TPs of heaven, earth, and humankind, and God's words of Principle we can make a reciprocal foundation and relationship. We can make changes that move heavenly fortune. That is why TF wanted 210 generations of liberation/blessing ancestors. Don't say "my life is not working well." It is because you don't live a Principled life. We have to check if I am a person doing give and receive action with God and centering on goodness, or not. In the church culture, if members live well off, we didn't think that they are prospering because they live well. Instead we wondered if they used public money or something, to live so well. Members live well because they live Principled lives. We have to attend God/TPs and live Principled lives. After FD there will be a clear division between those who live with Principle and those who are not living with Principle. You have to realize about yourself: "I am not a Principled person." We will be living in the CIG nation. We received the blessing, and are w/o OrigSin, and we should become perfected men and women. We should be humble. But we didn't live that way. But even if I understand myself, even if I live with Principle, we think I don't have Osin. Even we ignore other people, other religions, etc. God has been guiding the Providence of Restoration through Indemnity, and now this is WitnessingActivity. After FD, the way to go to heaven is to invest in WitnessingActivity. Become one and invest your entire effort. Remove your fallen nature, and don't drink, smoke or take drugs. Some members tell me "I have to drink; it is for business!" But, if you drink , your business will be perishing! Don't drink. If someone is not your spouse, don't look, don't touch, don't eat. Absolutely! Be afraid of public money. This includes tithing. If you don't tithe, you are violating public money. People say that Hoon Mo Nim violated public money. But, she did not! Go to church, and attend church leaders; love younger members, and respect senior members. This is what it means to be a citizen of CIG. If you don't attend church, and tithe, and if you do sin, you are not a citizen of CIG! You must live life as a citizen of CIG. When you do chan yang sessions, go to the prayer hall (Cheongshim won). Centering on your conscience, make a report prayer to God. Report all the things you have done, and the spirit causing those problems will be removed. TF: on FD, for him to remove all your sins there will be holy wine. TMother asked me if I had the holy wine. Things (sins) that you know conscientiously, express with remorse. Then, on FD, if you drink holy wine (HW), your sin will be cleaned up more. After HW, your bad habits must stop; you need to change! To become such a person, we have chan yang session. This time, in making sincere devotion and prayer conditions, the pain I had was so big, I could not even imagine. It was so painful. I felt something may happen to me. It is to prepare for FD I can see. Prepare well so we can live with heavenly fortune. I had to make many conditions. If I ask you to make conditions to come to CP, you would not be able to come! I had to block ES from blessed family members, or ES would stop you. TPs gave resolution by 2020 we have to fulfill. We must think that this Providence of Restoration through Indemnity is MINE! We have to DO such restoration in our lifetimes. Please understand. While you are here in CP, work hard. I will help you. Please attend cys well. Please become enthusiastic members in God's providence. Tomorrow we will have the Peace World Center service with TMother. Please attend. Please be healthy. We are people attending God/TPs. I hope you can become such members. I hope you can receive all the grace. I will close here. Thank you very much.